The best way to see an iconic and beautiful Yellowstone cutthroat trout is to catch one. 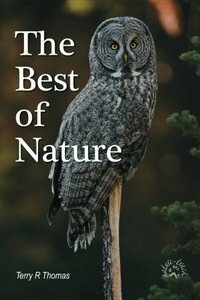 What unique and charismatic wildlife species best represents the West? Elk would certainly come to mind, but elk originally wandered far outside the 11 western states. Grizzly bears and bison are the same: certainly western species, but also great wanderers with ranges that reached well into the plains states. Even mule deer, generally regarded as a truly western species, ranged into the Midwest. To truly represent the West, I would cast a vote not for a hairy creature, but for a finned one. With 14 subspecies, the cutthroat trout is the most diverse trout species in North America. Its historical distribution is broader than any stream dwelling trout in the Western Hemisphere, yet it is truly a western species. Cutthroat subspecies developed from common ancestors when discrete populations became separated over time through geologic changes. The subspecies eventually developed distinct characteristics which warrant unique designation. Several of the subspecies can only be differentiated by genetic analysis; nonetheless, they are still distinct. Idaho’s ocean link provides us with five species of native trout: bull trout (which are actually char), redband trout (which are a subspecies of rainbow trout) and Yellowstone, westslope and Bonneville cutthroat trout. Brook, brown and all rainbow trout outside the Columbia River system are introduced. A good argument for the cutthroat trout as the iconic western species is that 10 of 11 western states have native cutthroat trout and seven of the 11 states honor cutthroat trout as their state fish: Lahontan cutthroat trout—Nevada; greenback cutthroat trout—Colorado; Rio Grande cutthroat trout—New Mexico; Bonneville cutthroat trout—Utah; and generic cutthroat trout as the state fish of Idaho, Wyoming and Montana. And although cutthroat trout are widespread in the West, their native range does not extend into the plains. Although all subspecies of cutthroat trout are iconic for the West, most subspecies are struggling. Two subspecies are extinct and three, Lahontan, Paiute and greenback cutthroats, are listed as threatened under the Endangered Species Act. Most remaining subspecies have been petitioned for listing at least once. The reason for the declines includes habitat destruction and fragmentation with subsequent constricted range, but most scientists agree the most pervasive threats are non-native trout. Rainbow trout are particularly onerous as their springtime spawning season overlaps that of the cutthroat and the two species readily hybridize. Brook and brown trout both spawn in the fall but can crowd native cutthroats from their niches. Idaho uses creative management to improve cutthroat populations and forestall listing. 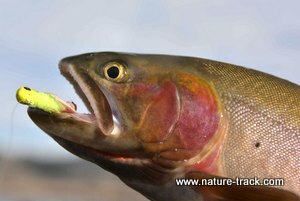 Cutthroat trout are managed conservatively with a variety of catch-and-release, size and bag limit strategies to carefully control harvest. More creatively, in areas like the South Fork, extra harvest pressure is applied to competing rainbows in the form of removal of limits and even $1000 rewards for keeping a tagged fish, all intended to reduce competition and hybridization. There is only one problem with cutthroat trout as the West’s iconic species: you don’t see them unless you catch them. I guess we’ll all just have to go fishing.